Visions are taking shape: In the world's first eco city, "Masdar City" in the Emirate of Abu Dhabi, urban life is awakening. Students work at the research institute for green technologies, business attract customers, and electric vehicles glide to their destination. For the first time in 2011, there was even an organic food market and a street festival. Hansgrohe is also making its presence felt here – a new high-tech world covering six square kilometres of desert sand, where it's all about climate protection and conserving resources: Mixers and hand showers from the Black Forest make the bathrooms in "Masdar City" extremely environmentally sound. Resource-conserving mixers and showers "Made by Hansgrohe"
The city with a neutral CO2 balance, which does not release any waste or pollutants into its environment and creates its own energy, is still some way off completion. But those parts of the city that have been completed have settled into a routine of everyday life. In just a few years, the spectacular design of the renowned planner from Foster + Partners has become a tangible reality. Even though the construction, which is intended to accommodate 50,000 residents, is expected to take up until the year 2020. The project, financed by the Emirate of Abu Dhabi, is estimated to cost around 22 billion dollars. (Richard Grohe, Executive Board of Hansgrohe SE). The initiators of this project intend to provide for a future after the oil era. And to use a living model of everyday life to demonstrate how to achieve city amenities with zero emissions. 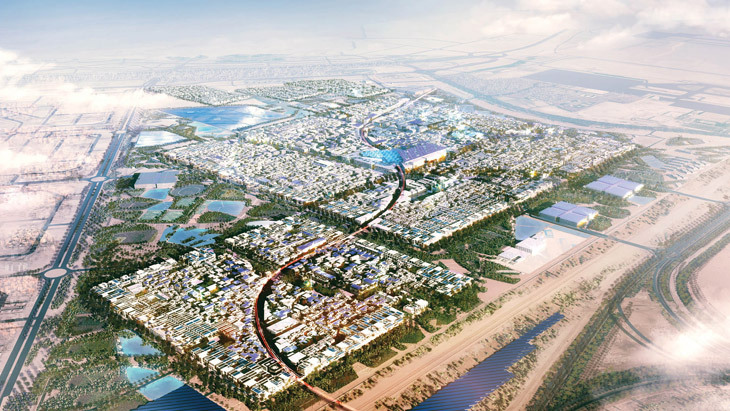 "Masdar City" already has electric pod cars, which run on a monorail system – or are conducted through guidance systems embedded in the road surface. Here, 30 kilometres from Abu Dhabi City, solar power is created in a variety of ways. In addition to a solar energy-generating field and lots of buildings with photovoltaic systems, the "Knowledge Center" on the campus also accumulates energy. All the windows are shaded, and the intelligent use of wind power replaces the need for air conditioning. The planners made use of ancient building knowledge and adapted it for living in the desert. Situated between modern façades, which are often adorned with arabesques, narrow streets are the norm in Masdar City. This is because they provide shade and use the stack effect for air circulation. Metris S electronic wash basin mixers and hand showers from the Raindance EcoSmart range, all water- and energy-saving items offering many benefits.